There are a number of ways you can get involved with the Garden and we always welcome new ideas and suggestions. Please get in contact to discuss volunteering, running your own event or to talk through ideas you might have about becoming involved. Visiting and Enjoying - come along and simply enjoy being in the Garden. It is a very special place. Details about opening times are given on the Visiting the Garden page. 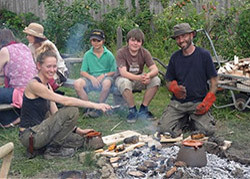 Booking the Garden - for a party, workshop, course, family gathering, celebration or away day. The Garden offers a unique private indoor and outdoor space with some special features such as a sand pit, tandoor oven, bonfire and barbeque area and wooden eco cabin which can seat forty people. See Booking the Garden page for costs and further information. Come along to an Event - From bread making courses to gardening groups, cooking demonstrations, and green building projects, Sunday Toast, art events, storytelling and stay and play sessions – there is something for everyone whatever your interest, ability and mobility. Have a look at our Events page for details. You might also find yourself inspired to run your own event. Become a Volunteer - the Garden is run by volunteers and people are needed to plan and help at events and do practical gardening and maintenance tasks. Our volunteers provide regular and one-off cover to ensure the Garden is open to everyone during weekends in the summer. Details of our one-off gardening volunteer days are given on the Events page. Become a Trustee - if you feel you have the time and commitment to take on a more demanding role the Garden Project always welcomes enquiries from people who might like to become a trustee. Involve your Company, Workplace, Club or Group - we hold a number of volunteer days with organisations who want to give something back to the community. The Garden is also a great venue for work events, training days and away days. Would you like to hold your own event at the Garden? Go to the Booking the Garden page for details. Contact us to discuss volunteering, running your own event or ideas you might have about becoming involved. Donate to the Garden to keep it open for everyone to use throughout the year.